Population (1 Jan 2003): 15.593; area: 387,68 km² (of which water: 361,08 km²). Settlements: Harlingen (seat), Midlum, Wijnaldum. Flag: Yellow, with thin top and bottom stripes of blue. In the centre of the yellow is a white circle, outlined in blue. This circle contains some arms - quartered with 1st and 4th the same, with three of something black in them, and the 2nd and 3rd contain three of something red. These could be stars, or could be crowns. It's very difficult to tell. 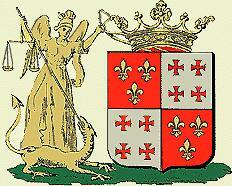 The 1st and 4th quarter of the circle red with three golden fleur-de-lys placed 2 and 1. The 2nd and 3rd quarter silver with four red crosses pattée. Harlingen/Harns is one of the oldest Frisian towns. According to legend the oldest Frisian flag, known as the 'Magnus-fane' was buried in the churchwall of the old town of Almenum, which was swallowed by the sea (c. 1000 AD). The present municipality contains parts of the old municipality of Barradeel. Flag: Three stripes blue and yellow, 1 : 6 : 1, with on the middle of the yellow stripe a circle with a blue border as wide as a blue stripe, with inside it the charges of the municipal arms." Adopted 10 Mar 1857. The flag is derived from the Coat of Arms, which dates from the 15th century. Details can be found at Ralf Hartemink's site: The shield is: Quartered: I and IV: Red three lilies gold, placed 2 : 1; II and III: Silver four broad-armed crosses red. Note that the date is not a typo. Wimpel of the city and municipality of Harlingen - Harns, Fryslân province. A square red hoist charged with a yellow lily; two vertical equally wide stripes of blue and yellow. In the Genealogysk Jierboekje 1986 (pp. 96-98) was a proposal of a white hoist charged with a red St. Michael's cross, with two stripes blue and yellow. The population of Harns made it known that it wanted a red hoist with a yellow lily, after the first quarter of the city arms. The blue-yellow stripes remain as they were and are modelled after the official colors of the Frisian Eleven Cities. Sierksma's Nederlands Vlaggenboek 1962 [sie62] mentions two flags of Harlingen: the present one, and: three equally wide horizontal stripes red - white - yellow. This flag is derived from the municipal arms. It was probably seen by the Dokkumer Hesman in 1708 and drawn in his Flagbook. It is remarkable that the more elaborate flag (more expensive!) is in use up till now, while the simpler one has completely disappeared. from the Harlingen municipal website. "Zeemans-Voorzorg" (Seaman's provision), Harlingen. Leen Smit pictures number 39. Existed in 1859, but no longer in 1979. Flag: White with red upper edge and blue lower edge, ca. 1:4:1, with a black "H" followed by a number. A main event in Harlingen is the yearly "Lanenkaatsen" competition, organized since 1950. "Kaatsen" means (sort of) in Dutch "to play real tennis", the "kaatsspel" (sort of real tennis) being a very ancient, popular Friesian game. In Harlingen, the game, played in the streets ("laan"; plural, "lanen), is called "lanenkaatsen". The website dedicated to the event shows photos taken during the 2004 competition; on one of the photos, lanenkaatsen's enthusiasts show a yellow flag with thin blue stripes on top and bottom and a blue ring surrounding a blue, sitting silhouette. The flag is, undoubtedly, based on the municipal flag of Harlingen. Scroll down, down, down, down. The name of the says "Flag handed over by the inhabitants of the "Lanen" to the Committee"